and patio area. Manufactured from 100% recycled aluminum and made in the USA, our clocks and thermometers show beautiful detail and craftsmanship. Instructions included. Very Light Assembly Required. Maintenance free with AA batteries included. 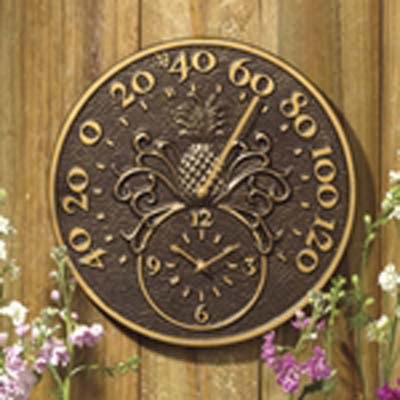 and Thermometer line is perfect for any garden and patio area. Manufactured from 100% recycled aluminum and made in the USA, our clocks and thermometers show beautiful detail and craftsmanship. Available in a variety of colors and designs, we have something for everyones taste and dcor. All clocks use AA batteries that are included.